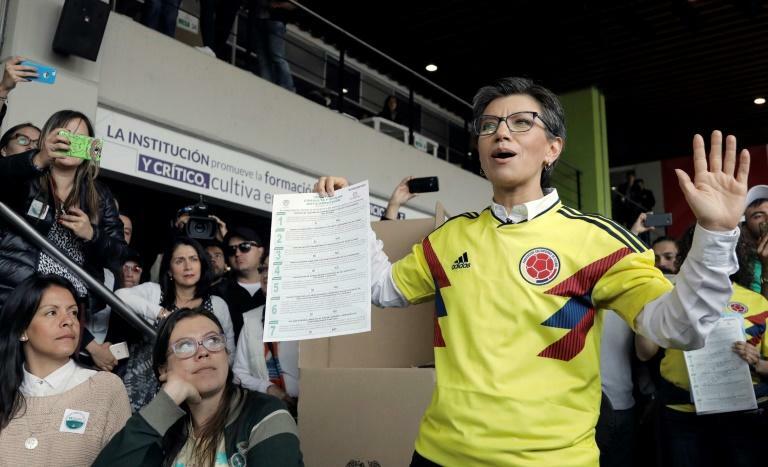 Colombians on Sunday failed to approve rules that hardened punishment for corrupt officials, a measure sent to voters as a referendum after congress proved reluctant to implement stricter anti-graft measures. Some 36 million voters were called to the polls amid an ongoing bribery scandal involving Brazilian construction giant Odebrecht that has engulfed the region. With almost all ballots counted by late Sunday, the measure was 470,000 votes short of the 12.1 million votes needed for approval, election officials said. "Ninety-nine percent of those of us who voted support the initiatives," President Ivan Duque said in an address to the nation. "Unfortunately the number of votes did not reach the minimum needed for approval," he said. Duque, in office only since August 7, was in favor of the measure even though it had only had lukewarm support from members of his rightwing party, the Democratic Center, which have a majority in the senate. "We were five cents short, but change is unstoppable and here there was a shaking of the traditional political class," said Green Party Senator Angelica Lozano, who also supported the measure. Colombians "want genuine changes to the political practices and to corruption," she told reporters. The measure included seven proposals, from cutting high-ranking officials' salaries to imposing term limits to eliminating house arrest as a punishment. While mostly aimed at cracking down on abuses by public officials, the initiative would have also made private contracts with the state more transparent, and ban companies convicted of corrupt practices from dealing with the public sector. One university study found that, from 1991 to 2011, corruption cost Colombia 4 percent of its GDP.